Research Week features a poster showcase and more. To celebrate this, UC Merced dedicates a week each year to highlight some of the significant work being conducted at the university. It is an opportunity for the public and the campus community to see the many innovative projects underway. While the community is welcome at most Research Week events, three events are specifically designed to engage the public, including the Nicotine and Cannabis Policy Center (NCPC) Community Forum from 5-6:30 p.m. Tuesday, March 5, at the Downtown Campus Center on 18th Street. Attendees will hear from the faculty director, Professor Anna Song, who will provide an overview of the NCPC and share some initial findings. The NCPC is currently working with local community members across 11 counties in the San Joaquin Valley and surrounding mountains and strives to help reduce tobacco-related diseases and deaths in this overlooked, underserved region of California. Valley residents are significantly more likely to use tobacco and other drugs, and to experience tobacco-and drug-related illness, studies show, yet there is limited health and health policy data on the region. The NCPC aims to actively help the local community and position UC Merced and the Valley as leaders in the study of public health and policy matters related to tobacco and marijuana. 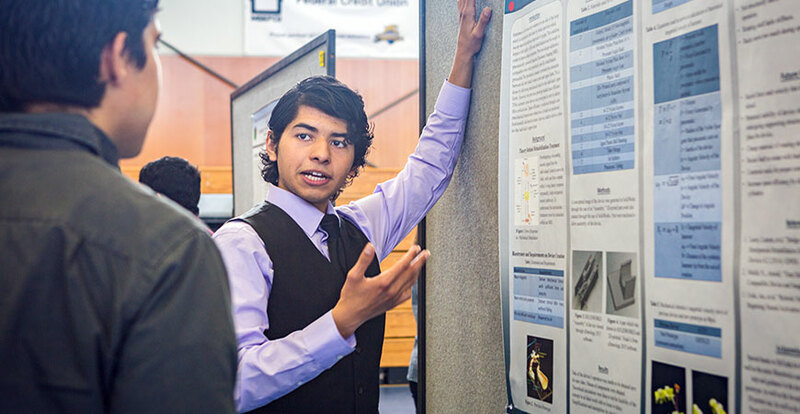 On Wednesday, March 6, everyone is welcome at the Joseph Edward Gallo Recreation and Wellness Center’s gym for the research poster showcase, which this year is combined with the Merced County Office of Education STEM Fair. The annual exhibit of UC Merced student scientists’ work will now include Merced County sixth, seventh and eighth graders who have advanced from STEM fairs at their individual school districts. He’s working with MCOE to bring the event to campus, offering the younger students a unique opportunity to meet and learn from older students and faculty scientists. The students and their families will also get behind-the-scenes tours of the campus and some of the restricted research facilities. The MCOE students who prevail at the Research Week STEM Fair are on their way to the California Science and Engineering Fair in Los Angeles. The feedback they receive from UC Merced scientists could prove invaluable in helping them ready their projects for higher-level competition. The UC Merced event will also let the younger scientists and their families become familiar with the campus and its extensive research. They’ll see the SCIF, the imaging and microscopy labs, the Environmental Analysis lab, the WAVE facility, the supercomputer cluster and more. The students are invited to bring lunches for an informal gathering with older students and faculty members, and there will be an awards ceremony in the afternoon when they will find out who’s going to advance in the next level. UC Merced students will also get more practice in explaining their projects to younger and non-science audiences, which Gravano said will help them on their journeys through college and beyond. The third event meant to highlight UC Merced’s connections with the community is the Community Engaged Research Reception in the Sam Pipes Room at the Merced Civic Center from 5-7 p.m. Thursday, March 7. Merced community members are invited to the reception that includes presentations by faculty members, students' public humanities projects and a wide display of UC Merced research posters. Gravano and other research facility leaders will also offer campus tours to anyone who wishes to participate on Tuesday, March 5. Naturalists will guide visitors through parts of the Merced Vernal Pools and Grassland Reserve, while others will take people through the SCIF and other core research labs. The reserve tours are at noon and 1:30, and the other lab tours start at 1 p.m. They are offered on a first-come, first-served basis, and people are asked to meet in the quad between the Science & Engineering buildings. Lab tours depart every half hour through 3 p.m.
Other events this year include the Sierra Nevada Research Institute Symposium on Monday, March 4; the Assessment as Research Symposium and the Research Visualization Workshop, both on Wednesday, March 6; the RadioBIO GRADstory event on Thursday, March 7, at which graduate students can engage with their peers in live interviews to be broadcast from the campus’s new dining center. Finally, the week wraps up with the Undergraduate Research Opportunity Center Panel on Friday, March 8. “Research is at the core of who we are at UC Merced,” Vice Chancellor for Research and Economic Development Sam Traina said. “Creation of new knowledge through research is a mission in its own right, but it also informs our instruction and is an important component of our broader service to the community and to society at large. “I encourage the public to come join us in this celebration and see the exciting things we are doing,” Traina said. For a complete listing of events, times, dates and RSVP information, see the schedule online . Paid hourly parking for campus visitors is available in the Bellevue lot.